The Capital Asset Pricing Model provides interesting insight about investor expectations. A core assumption in the theory is that the average person is risk averse. This means that he or she would like to get the highest possible return with the least amount of risk. For example, given the option between receiving $100 and flipping a coin for a chance at $200 or $0, most individuals will take the $100. Because investors are risk averse, they will tend to demand a greater return for taking on more risk. Below is a chart that shows this basic idea. As standard deviation – or risk – increases, so does return. 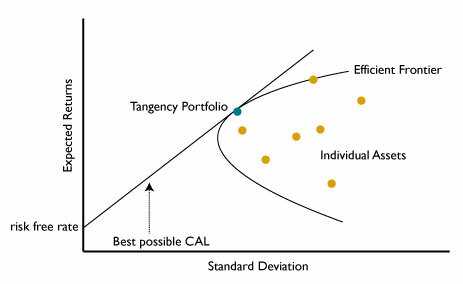 Any point on the straight line represents a portfolio that includes the risk free asset and a risky asset. I won’t go into the details, but basically that line represents the optimal portfolio in terms of providing the best return for the least amount of risk. Any point above and to the left of the line is not attainable. For example, an investor who does not want to risk the loss of principal (which equates to wanting 0 standard deviation) can at best hope for a return equal to the risk free rate (or U.S. Treasury Bills). To expect any more than that is, according to the theory, irrational. Even though historical results may have no bearing on the future, most people use historical returns of the S&P 500 to set expectations. One issue with this is determining what timeframe to use. In his book Stocks for the Long Run, Jeremy Siegel uses a 130-year period to come to an expected stock market return of 6.8 percent, adjusted for inflation. Different time periods can and have been used to determine different expected returns. Another issue to consider is holding period. Any expected return for the market is based on holding that portfolio for a very long period of time. In fact, an investor may have to hold the portfolio for 130 years to see the returns Siegel predicted. In other words, over 3, 5, or even 10 years, results can vary drastically from what is expected. The point of this rather academic discourse is to remind readers that it is important to have realistic expectations. The portfolio with the best risk-adjusted return will be diversified and fall somewhere along the line in the graph above. A diversified portfolio will have similar returns to the overall market. Expected returns of the market are difficult to predict, but the past may provide some guidance as long as the investor’s holding period is long enough. Data spanning 130 years suggests that a 6.8 percent return over the long run may be reasonable. The S&P 500 Index is an unmanaged composite of 500-large capitalization companies. This index is widely used by professional investors as a performance benchmark for large-cap stocks. You cannot invest directly in an index. U.S. Treasuries are short-term debt securities issued by the U.S. government to fund its operations. T-bills usually mature anywhere from one month to one year after they’re issued. Instead of making periodic interest payments, T-bills are sold at a discount and rise to their face value at maturity. A statistical measure of the historical volatility of a mutual fund or portfolio, usually computed using 36 monthly returns. A measure of the extent to which numbers are spread around their average. The greater the standard deviation, the greater the fund’s volatility.